509 BC - The first troll, Spamicarus, is caught passing off used pig shoulders as rare cuts of meat to unwilling customers and is thrown into prison. Sadly, this is both the first and last account of such a thing ever happening to a spammer. AD 30 - Jesus receives a letter from the king: "B UY [email protected] AND WE W ON'T K!LL YOU--" and tosses it into the river. 433 - CLAIM YOUR FREE MULE!! 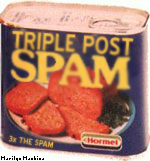 1971 - Spam spam spam spammity SPAM WONDERFUL SPAM! WONDERFUL SPAM! 1980 - GET FREE SPAM HERE! ONLY $1x10^100!! 1992 - WIN A FREE iPOD! YOU HAVE NEW MESSAGES! WOOHOO! 2001 - HOT PICS AND CHAT - CLICK HERE!!1! 2002 - SPAM: SPECIAL EDITION! OVER 900 HOURS OF DELETED SPAM!! ! 2004 - THROW A DUCK AT SADDAM AND WIN - CLICK HEAR!1!! 2009 - CLICK HERE TO GET AN IDEAL BIN - ONLY £5X10^123456797540000000!!!!!!! !